Police officers stand guard in front of a Catholic Church in Ngagel, Surabaya. Indonesian police say a family of six, including teens and two children, were responsible for the suicide bombings of three churches on Sunday that killed at least 13 people and wounded 41 others in the city of Surabaya. Islamic State claimed responsibility for the blasts, which Indonesia's president called "barbaric", in the country's second largest city. The family had reportedly recently returned to Indonesia from Syria. National police chief Tito Karnavian said the bombers included a mother and father, two daughters aged 9 and 12 and two teenage sons, adding that they were linked to the Islamic State-inspired group, Jemaah Ansharut Daulah. “They have been cornered by the West, including U.S., in Syria, and they have to return to Indonesia," Tito said of the group, calling on Indonesia's parliament to pass a revised anti-terrorism law. “We can’t take any actions without legal basis. The previous law is outdated," he told a news conference, adding that police would call on the president to issue a decree to enable them to move quickly to fight the terrorist cell. Police stand guard near the site of a blast at the Pentecost Church Central Surabaya, in Surabaya, East Java, Indonesia, May 13, 2018. "This act is barbaric and beyond the limits of humanity, causing victims among members of society, the police and even innocent children," President Joko Widodo said during a visit to the scene of the attacks. President Joko Widodo visiting the location of a bomb attack in Surabaya. The U.N. secretary-general condemned the attacks in a statement Sunday, noting that he was "appalled" that children were used in the bombing. "The Secretary-General expresses his condolences to the families of the victims and wishes a swift recovery to those injured. He reiterates the support of the United Nations to the Government and people of Indonesia in their efforts to fight and prevent terrorism and violent extremism, including through the promotion of pluralism, moderation and tolerance," Stéphane Dujarric, spokesman for the Secretary-General, wrote in a statement. Debris seen outside Santa Maria church, where an explosion went off in Surabaya, East Java, Indonesia, May 13, 2018. 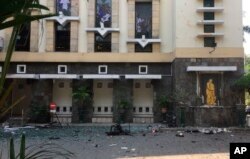 Media reports say simultaneous attacks on churches in Indonesia's second largest city of Surabaya have left casualties. 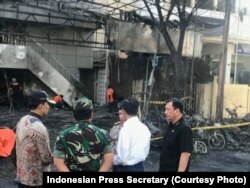 Indonesian Muslim and Christian organizations (Nadhlatul Ulama and Communion of Churches/PGI) condemned the attacks and issued a statement saying there is "no single religion in the world that justifies violence in achieving our goals." The groups urged the government to take "decisive and swift steps" to tackle terrorism and radicalism. 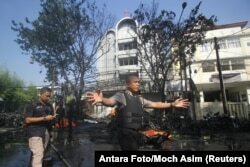 Police have ordered the temporary closure of all churches in Surabaya. A large food festival in the city has also been canceled. Churches in Jakarta, Indonesia's capital, canceled morning services. Jakarta is on high alert after the three bomb attacks in Surabaya. The National Police have tightened security across the capital, especially around vital objects and strategic locations. There are no details yet why the police increased the alert status, or whether there is any terrorist threat to the capital. The attacks in predominantly Muslim Indonesia came days after police ended a riot and hostage-taking at a detention center near Jakarta that left six officers and an inmate dead.